Kellan Lutz anlände till Lax för att åka vidare till Vancouver för att filma Breaking Dawn, han ser lite trött ut men han firade säkert sin 26års dag väl :) Vill ni se mer bilder på Kellan kolla in på popsugar.com. 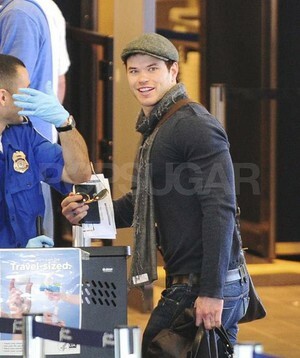 Såhär skriver dem: Kellan Lutz was in good spirits as he went through the security line at LAX yesterday. He’s heading to Vancouver to rejoin his Breaking Dawn castmates who made the trip north, including Peter Facinelli, who touched down in Canada on Monday. Kellan’s coming off a fun break from work, during which he rang in his 26th year with his brother Brandon.